Home » Comics » Crimespree on Comics: Kate (and Dan) interview Mitch Gerads. Crimespree on Comics: Kate (and Dan) interview Mitch Gerads. Welcome back for another installment of Kate (and Dan) Read Comics! For today’s column, we’re happy to offer you something special. What follows is the first ever interview ever done for K (&D) RC! 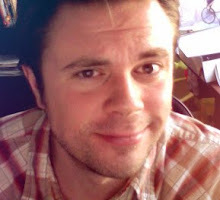 Minneapolis illustrator Mitch Gerads was kind enough to take time out of his busy schedule for a little email “Q & A.” Mitch is something of rising star on the comics scene, having done work for Boom! Studios and IDW. His latest project is the new ongoing book from Image comics, The ACTIVITY. K (&D): We hear you have a new on-going book coming out from Image Comics! For those that haven’t followed your tweets, or seen the Newsarama posts, what can you tell us about the book? Mitch: It’s called “The ACTIVITY” and it’s out this December from IMAGE Comics. It’s a new ongoing series written by Nathan Edmondson, who was the writer behind the recent Image hit, “Who Is Jake Ellis?” and writer of “Grifter” for DC Comics. The ACTIVITY is based around the real-life organization known as the Intelligence Support Activity. They act as a bridge and support between the US Military Special Forces and Intelligence. Our book centers on a five person “direct-action” team within that organization. It’s a real world, modern day, military thriller for fans of Special Forces, spies, the Call of Duty games, etc. Nathan and I LOVE this stuff. We both are huge fans of the genre and we’re really excited to bring this world to comics, where it’s been severely unrepresented. K (&D): This is a creator-owned book, right? The book’s writer, Nathan Edmondson, seems to be pretty much everywhere lately. Can you tell us how the collaborative process works with you guys? Does Nathan give you very detailed settings/character designs/etc., or do you have free reign for your imagination? Mitch: One of the joys of working with Nathan is the book is HUGELY collaborative. Nathan and I talk nearly daily and we hammer out where we want the characters to go, how the book is to develop, story ideas, etc. At the end of the day, Nathan will write me a full script and I’ll begin work. Once I start pages, Nathan is very open to how I interpret things within the script etc. As an artist, that’s both rare and inspiring. We’ve really hit our groove as co-creators on each issue. K (&D): As mentioned earlier, you’re pretty active with social media, twitter in particular. How would you describe twitter to someone who’s never used it before? Mitch: In this day and age if you’re still one of those people who just says Facebook and Twitter are a waste of time then I hate to tell you, but you ARE being “that guy”. Social Networking is today’s light bulb invention. It’s the telephone of our current world. Anything you are into, there are like-minded people out there who are also into that same thing. Twitter allows us to find those people, to build exciting conversation, to meet new people. As far as comics go, I have gotten where I am and had the opportunities that few get, almost solely because I embraced social networking as an open forum to connect with people I would otherwise not have been able to. I’m sure you can tell how excited I am by this topic. I really could go on and on, but I will spare your readers. Mitch: Aaaaa…you must mean Numchucks (dun dun DUUUNN). Haha, Numchucks is my little gray farm cat who will one day be our dark overlord and master. She’s pretty much the cutest cat you’ll ever see, but she’s evil incarnate, which I really like. She entertains me to no end. K (&D): At what point did you finally say, “I’m going to do the comic-book thing full time?” Were you sitting at your 9-5 job and just threw your pencil down and say “Mitch OUT?” (This is how we imagined it went.) At what point did you realize “Yeah, I’ve got the chops to make this a career”? Mitch: I was illustrating cereal boxes for General Mills and the company I worked for had massive layoffs, which included me. This was right around the time that longtime friend and writer, Scott Dillon and I were working on a self-published comic (Johnny Recon), mostly just for fun. We had such a good time and the book had such a good reception that I figured I would use this time and unemployment to give the dream I’d had since I was 6 years old a shot! It wasn’t easy by any means, but I put in the work, and continue to do so, and here we are! K (&D): The first comic Dan ever read was West Coast Avengers #1. 1987. He bought it for $0.75 off a spinner rack at a gift shop in Brainerd, MN. What comic “hooked” you? Mitch: I grew up with two much older brothers who were both into comics and I idolized them, so I was around comics from as far back as I remember. The book I remember having the most impact on me was reading my brother Greg’s copies of Mike Baron and Steve Rude’s Nexus. That book sparked everything in me. After seeing those, even at age 6, I knew what I wanted to do when I grew up. Mitch: I subscribe to the Grant Morrison school of thought on this topic. The answer is always Batman. Batman will always find a way. I love the big blue Boy Scout, but Batman is the ultimate character. K (&D): Favorite comic book “moment” of all time? Mitch: This answer is directly tied to the previous question. My favorite comic moment of all time was in Grant Morrison’s run on JLA. I’m not sure what the issue # was, but the entire JLA (Superman, Flash, Wonder Woman, Green Lantern, etc.) have been captured by an invading alien race. Superman is held captive, broken, and bleeding. The alien starts to gloat that they’ve beaten and captured all of Earth’s heroes except the “measly human” known as Batman. The barely alive Superman just starts laughing and tells the alien how f—ed they are. Then Batman takes down an entire global invasion Die-Hard style. One of the few comics to ever give me legitimate goose bumps. K (&D): Much of this interview has focused on modern tech. What are your thoughts on the future of the comic book medium – will we still have comic “books,” or do you think fans will be downloading their books onto iPads every Wednesday? Mitch: Could be, but not for a long long time I would venture. iPads and its ilk are still too expensive for them to take over print anytime soon, but the new digital comic landscape is really bright. If a book on my list is offered day-and-date digital, that’s how I get it. For me it’s mostly about space saving. One of the most exciting prospects of digital comics to me is also the presentation. Have you ever read a comic on Comixology with their Guided View™ presentation? It changes the whole feel of reading a comic. I’m not saying it’s any better than normal, but it’s really fun and new. Mitch: Please go to your local comics retailer and ask to pre-order The ACTIVITY #1 coming in December, or better yet, ask them to put it on a monthly pull list. Pre-ordering insures you get your mitts on a book that could definitely sell out and really helps the market! Dan and Kate Malmon are a happily married couple (except when Dan forgets to put the seat down) in Roseville, MN. When not working, reading comics and mysteries or watching sports, they hang out with Franklin the dog. You can find both Kate and Dan on Twitter.